The Stone Barn offers two outdoor ceremony sites as well as an indoor option. Depending on the time of year and the vision you have for your ceremony, we are happy to help you choose the best location! When opting for an outdoor ceremony, an indoor location for inclement weather is always included. 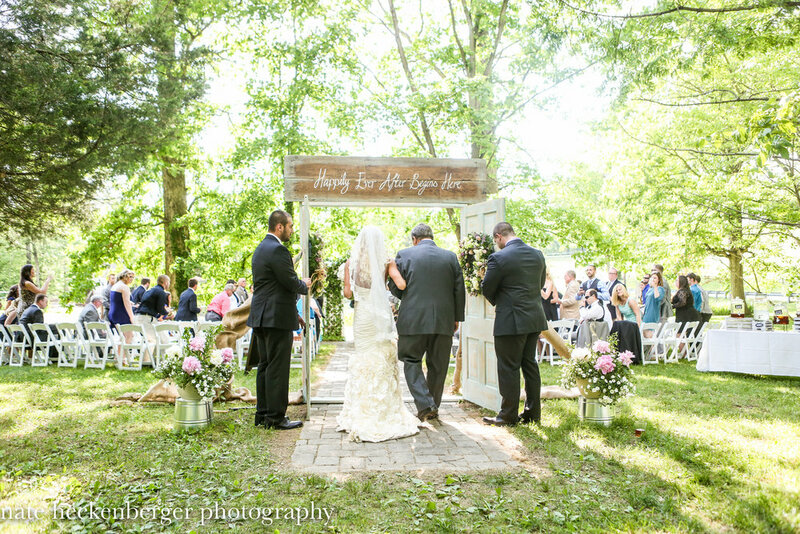 Ceremonies are available only to groups holding their receptions at The Stone Barn. Have you dreamed of saying "I do" in an intimate garden setting? The Dogwood Knoll wedding site offers flowers in spring, lush greenery in summer, and colorful foliage in autumn creating picturesque backdrops for your special day. The Dogwood Knoll seats up to 200 guests. Embrace the tranquility of The Ponds as you say your vows in front of an ivy covered arbor and picturesque backdrop of ponds, spring house, antique water wheel & mill building. With yellow irises lining the ponds in spring, transitioning to a full green tree canopy in the summer, and showcasing the romance of turning leaves in autumn, The Ponds provide a unique setting for your ceremony. The Ponds seat up to 250 guests. The Fireside Room is much more than an indoor alternative for ceremonies. Featuring a grand wood burning fireplace as the centerpiece and backdrop for the exchanging of rings, the room boasts old world charm in the form of gas lamps, reclaimed brick & cypress board, antique single & double tree light fixtures, and wide plank wood floors. Sliding barn doors close off the adjoining rooms to make a more intimate space for the ceremony before opening up to the reception. The Fireside Room seats up to 120 guests, more can be accommodated with standing room by eliminating row(s) at the back of the room.